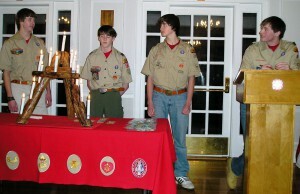 Cohasset Troop 28 held the 2009 winter Court of Awards on December 17th at the Lightkeeper’s Cottage. This Court of Awards saw a large number of rank advancements and merit badges along with a change in the running of the meeting. The ceremony began with the traditional Colors procession and the Pledge of Allegiance. The next part of the opening ceremony is the lighting of 13 candles which represent the 13 parts of the scout law. Alec and Derek lit each candle reciting — a scout is trustworthy, loyal, helpful, friendly, courteous, kind, obedient, cheerful, thrifty, brave, clean, and reverent – at each candle. Senior Patrol Leader Christian presided over the night’s ceremony. 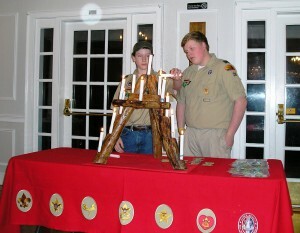 After the candle lighting, various scouts were called up to talk about the many trips the troop went on since the June 2009 Court of Awards. In another change from tradition, the advancement awards were delivered by SPL Christian, not the scoutmaster or the advancement assistant scoutmaster. There were a large number of scouts advancing, 15 in all – one Life, two Star, three First Class, seven Second Class and two Tenderfoot. Scouts from the Moose and Hawk patrols earned the ranks of 2nd Class and Tenderfoot. These two ranks are earned by mastering outdoor skills such as knots and camping. Hopefully by next summer these scouts will be well on their way to achieving the rank of first class. Scouts from the Stags and Viper patrols earned the ranks of Life, Star, and 1st Class. Life and Star require a scout to serve in a position of leadership; all require increasing hours of community service. For every rank a scout advances they must pass a Board of Review and Scoutmaster Conference. As the ranks get higher the Boards of Review become more difficult. Everyone did a fantastic job with their Boards of Review and even though some scouts didn’t earn the rank they had been working on, everyone learns from the process of discussing their progress in learning scout skills. The next phase of the ceremony was the awarding of Merit Badges earned. Most scouts earned 2-3 of these merit badges but some hard workers completed the requirements for as many as 6 merit badges. Two scouts received the award for completing the mile swim at Camp Squanto and the four Philmont participants – Christian, Robbie, Tucker and Morgan received the special 50 Miler Award patch. The Philmont guys also briefly discussed some of the cool things they saw and did at Philmont in July. After the ceremonies were completed and the flags properly placed in the back of the room, it was time to eat some of Mrs. Hillman’s delicious treats baked just for the occasion. This time she made Peanut Butter Bars and cupcakes along with chocolate dipped pretzels. Scouts left this Court of Awards with a full stomach and new goals for the coming year.